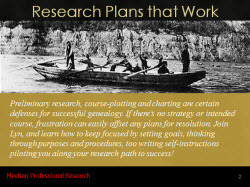 Preliminary research, course-plotting and charting are certain defenses for successful genealogy. If there’s no strategy or intended course, frustration can easily offset any plans for resolution. Join Lyn, and learn how to keep focused by setting goals, thinking through purposes and procedures, too writing self-instructions piloting you along your research path to success!